Pencil Brushes are mostly used in hand held cleaning of parts, but can also be motorized or used as replacement cartridges. The configuration is a stem, with filaments secured and extending from one or both ends. 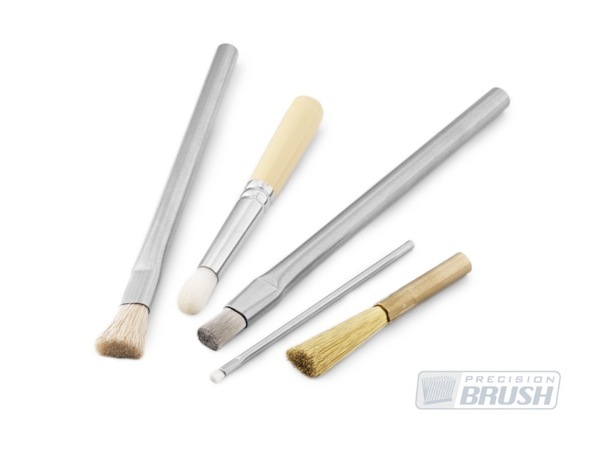 Pencil brushes are densely packed and available in custom lengths and diameters. A metal tube is the most common stem with filaments swaged or clamped into the tube by squeezing the metal. There is no soldering or bending of wires in the pencil brush production therefore the brush filling does not bloom or flaring as much as other brush styles. We can also use epoxy to secure the filament which allows us to use other tubes such as plastics or even fiberglass.